One area of Paris I had yet to explore before this most recent trip is that of Montmartre. Getting up to the top is a bit of a hike (I might suggest sneakers over slides to y’all), but in the end totally worth it! Seeing Sacre Coeur, wandering the little square in search of art and exploring the surrounding neighborhood was so much fun. A cafe I’d seen time and again on Pinterest and Instagram is La Maison Rose, where I shot these photos. This charming cafe is right around the corner from that aforementioned square, and was the perfect Parisian backdrop for my last outfit post in the city. We got to Montmartre around 9am, so the cafe wasn’t yet open – but it worked for me since nobody was around to ruin the shots! I’ll be sharing a bunch of my photos from around town (and this neighborhood) in a big roundup post on Saturday, so stay tuned! In the meantime, let’s talk about my outfit. While doing that partnership with Rebecca Taylor a couple weeks ago, I went to the store to try on a bunch of items for the InstaStories I was doing as part of the campaign. 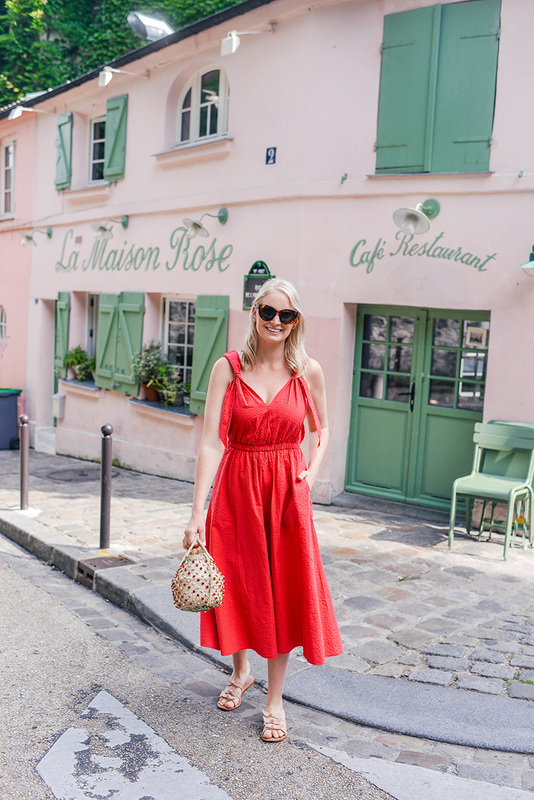 One item I tried on was this pretty red number – unfortunately it was not part of the sale, which is why I didn’t end up talking about it that week… BUT I loved it so much I bought it for myself to wear on this trip! Red is one of my favorite colors to wear, but I don’t wear it often. I’ve been told it’s “my color”, but I try to only wear it when I really want to wow. Which is why I only have a few statement tops and stunning cocktail dresses in this punchy hue. I’m changing my tune this summer with this dress though! This midi dress is literally SO comfortable (thanks to the stretchy waistline and soft fabric), it’s lightweight for hot days, and it does not show sweat! And on this day, boy, did I sweat. It was definitely the hottest day I’ve ever experienced in Paris!! Did I mention the color is called Rouge Rose? Quite a coincidence considering the name of the cafe I’m standing in front of. The last thing I want to tell you about is this darling little basket bag I found while I was in London! While walking over to Marylebone, we came upon a brightly-colored store called Koibird. It’s a seasonal pop-up that’s only open for weeks at a time, before leaving and coming back in a new location with a brand new selection of merchandise! The week we went it was all about vacation style: swimwear, straw hats, basket bags, statement sandals and fabulously bright earrings. SO obsessed! They really should make it a permanent store. Anyway, I found this beautiful bag and after chatting with the sales associate learned the bag brand is not available anywhere in the US! You can only shop them in-store by visiting one of these six stores. After doing some investigating though, I did discover they can be purchased online here! My exact colorway is not available, but they have SO many other pretty options! I would have loved to have the Nina Topaz Twist – so many great neutral stones, don’t you think? It sounds like a cute area! I definitely need to add it to my must see and this red dress is beautiful! !